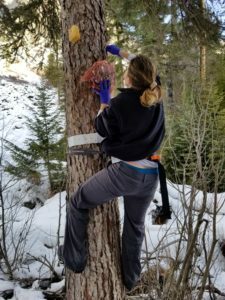 On an unusually warm and beautiful (if windy) Bitterroot morning, I hiked up Blodgett Canyon trail with wildlife biologist Rebecca Mowry (Montana Fish, Wildlife and Parks) and three fellow volunteers to maintain a fisher research site. 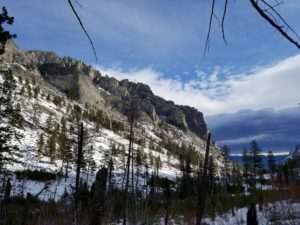 This is a joint project between Montana Fish, Wildlife and Parks and the Defenders of Wildlife. Volunteers from local area are helping to gather the data, allowing the scientists a little more flexibility with their schedules. What’s a fisher, you ask? Click here for a Wikipedia article! 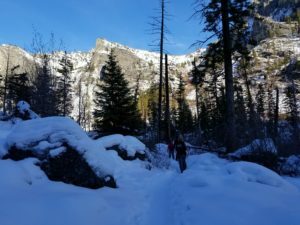 Blodgett Canyon is one of the most popular trails in the Bitterroots, so the snow on the trail was packed down, making travel easy. There were some icy spots, so I kept my microspikes on. A few miles up the trail, we reached the jumping off point for the research site. 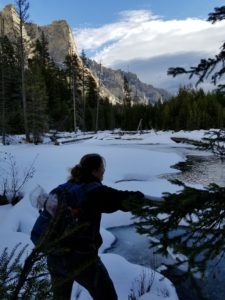 I was very happy I’d hauled my new snowshoes along, no matter how awkward they were to put on my pack. We crossed a wide, open area Rebecca said was a beaver pond. The snow was about three feet deep and there were several tricky spots, including an ice bridge across the creek. Fortunately, the winter sun doesn’t make it to the bottom of the canyon, so the ice bridge stayed solid. Even on snowshoes, Rebecca and I sunk into the snow. Our compatriots had a much harder time reaching the site, but we all reached it safely. 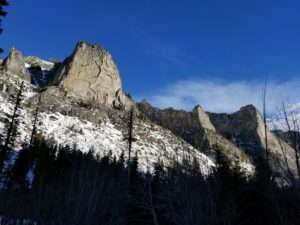 There are eighty different sites in the Bitterroot and Sapphire mountains. 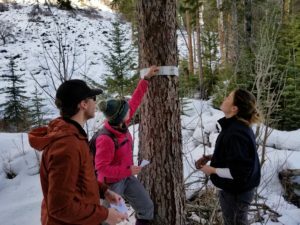 Most are focused on wolverine research although a lot of data has been collected on many different species through this program. Rebecca had already set up this site, so our job was to gather the data and reset the bait and data gathering tools. Each site has bait, barrel-cleaning brushes to gather fur from animals visiting the bait and a motion-sensitive camera to take pictures of each animal. The first task was to check the motion-sensor camera to see if there was any fisher activity. Unfortunately, our camera only caught a marten. Still, it’s pretty cool thing to see. One of my friends working a different site actually caught a wolverine on camera! Next, the brushes are collected and placed in individual envelopes so the DNA from the fur can be analyzed. Next, the bait is replenished. In this case, a small leg from a deer, and a sponge soaked in some truly noxious attractant. It really stinks! To reach the bait, tree screws are used. They’re screwed into the tree, then a person can climb up on them. A safety strap is essential. After both baits are finished, new brushes are screwed into the holders and the motion-sensor camera is adjusted and tested. I got to play fisher, crouching down by the tree and waving my hands around so the camera could be aimed correctly. Hopefully, we won’t have to change the aim on the next trip, just replace the SD card. Once complete, we packed everything up and trekked back across the snow. It wasn’t any easier on the return trip. The trip to the trailhead, however, was fast and easy. Weather was blowing in, so I got some pretty dramatic pictures. I hope you enjoy them! Previous Post Find out more about the Folding Space Universe! Next Post A Folding Space Prequel–Free! And Bargain Collections!